Our Steam group is open to everyone not just corp members! The Kherub Angels Steam Group is the official website of the in-game corporation of the same name and also is a public group for EVE Online and EVE Valkyrie players and fans in general. Feel free to join this group regardless if you plan to join our in-game corp or not, this group is for everyone not just corp members. 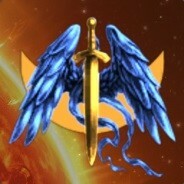 In general Kherub Angels (both the corp and Steam group) is about helping out and assisting new, returning and veteran players alike and aims to generate and support EVE related community activity and awareness. The in-game corporation supports the above efforts and in accordance with that also provides a no requirement to join 0.1% corpTAX environment for its corp members. For the time being that’s all we’re about, nothing more, nothing less. Everyone is free to join, leave and rejoin whenever You please, no questions asked (we won’t ask for your API key either), you apply and we accept, simple as that. At the moment we’re like most NPC corps, no requirements to join, corpchat available, no corp hangars, no offices, no corp assets, but in opposition with those the tax here is practically nonexistent. May you be new, returning or veteran, alpha or omega; PvP-er, PvE-er, industrialist, hauler, trader, miner or something else; may you join to stay for long or just to park your character temporarily; there is always a place for You here. Apply today …or whenever you wish. Tell about us to your friends… or enemies even, maybe they would be interested to join us. Do you have fleet ops? Such as mining,roams etc? Nah, as stated in the corp description quoted in the OP the corp is just to provide tax deduction and a place to park your characters, so no corp duties, no corp assets and as such no corp fleets / ops. However you can freely participate in public fleets though so shouldn’t be an issue finding a mining fleet, a PvP fleet might be more difficult to find. If you are focused on such activities and/or rather do those in a corporate environment then a related corp is a better choice than ours, mostly PvE focused players benefit from the minimal tax and inactive players benefit from the parking of characters, so our corp is mainly beneficial to them. We are always interested in Joint-Ops! Feel free to reach out if you are interested in joining us on Fleets!